As I've mentioned previously I used to subscribe to Glossybox but I cancelled this a few months ago because of money and also because more often than not I'm either disappointed with the contents or just not really bothered either way. I have been keeping an eye on the boxes though and if one looks particularly good then I may treat myself to it as a one off order. When I saw that the theme for October's box was dark romance I thought this sounded like it might be a good box. I was then delighted to find out that I'd won a 3 month subscription over on Beautiface and that this would start with the October box. I normally avoid any spoilers that appear on blogs and Twitter but when I saw a couple of tweets appearing slating this months box curiosity got the better of me and I took a little peek at the products that people had received. Unfortunately this crushed my expectations and I was no longer looking forward to receiving the box *sad face*. My box arrived yesterday morning and this is what I received. For a box based on a theme of dark romance I would have expected mostly makeup items in dark vampy autumn/winter shades, most likely including a nail varnish and lipstick and maybe something for the eyes like a dark eye shadow, liner or mascara. Opening the box it certainly didn't scream dark romance to me! This is probably the item that I would say most closely fits the theme. This is a cheek and lip tint a la Benefit's Benetint and the colour does say dark romance to me. Unfortunately I'm slightly scared of cheek tints! I already have Benetint and a similar Modelco version (that I received in a Glossybox not so long ago!) and I haven't tried either of these yet, so I now have another one to add to my collection. I have so many of these tiny perfume samples floating around, most of which have come from Glossyboxes! I'm not a fan of them as you can pick them up for free in department stores and perfume shops so it's really not very exciting receiving one in a beauty box. However I do think this one fits the theme reasonably well as I would say it's quite a strong evening type scent, maybe the sort of thing you would wear on a date. Call me superficial, but when I open a surprise beauty box I want to see pretty looking products waiting for me and unfortunately the packaging of this one did nothing for me. Aesthetics aside though this sounds like quite a nice product. This is a paraben free primer that contains reflective mica particles to brighten the complexion and also contains SPF 15. I guess at a stretch this could fit the theme, illuminating the skin to make you look your best, but it doesn't scream dark romance to me. To be honest I've never really been one for false nails. I've only tried them once or twice but in my experience they pop off quite easily or I have trouble getting them to fit my nails as I apparently have super slim skinny fingers. I am quite looking forward to giving these a go though to see what they're like. With regard to dark romance, I would say these were more girly romance! If they were some kind of berry type shade then yes but these are French manicure style complete with glitter over the white part of the nail. Like the Monu primer, this certainly didn't satisfy my need for prettiness! Also I really can't see how this product fits into the theme, nothing about this says dark romance to me. However I do like the sound of the product, especially as it's supposed to help soothe redness. So in general I'm pretty disappointed with this box and I'm glad I didn't actually pay for it. I may have been less disappointed if Glossybox hadn't built up my expectations with a theme and then not delivered on it. I would say it might be better if the boxes didn't have themes, or if they do, that Glossyboxes thinks really carefully about the products they use for it. 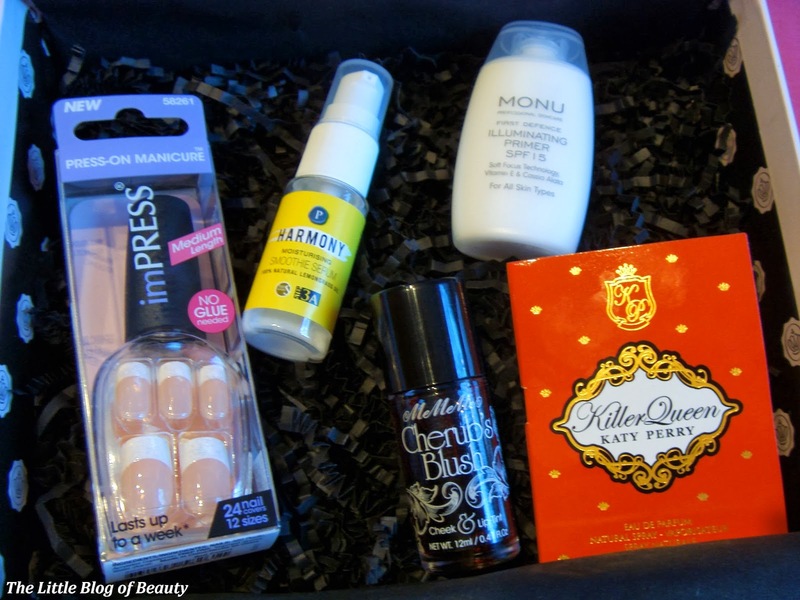 Are you subscribed to Glossybox and what did you think of this month's box? I was really disappointed this month! I think the only thing I will use is the cheek & lip tint. I reviewed this today too and was disappointed as well! I didn't get the perfume sample or the fake nails though!